We just got back from a super “Lap of Kentucky “ event with the Kentucky State Troopers. This event supports the NCM and Trooper Island kids camp. I think all os us attending: Larry, Donna, Howie, Lynda, Rosalee and myself had an unbelievable time. Our host, Master Trooper Jonathan Biven, is a super guide. He accompanied our group of 25 Corvettes through the entire week. We came from as far away as New Mexico and eleven cars came from Florida. If you want the details ask any one of us. I’m sure we will be attending next year! The NCM Museum in Motion event "One Lap of Kentucky" has been opened for reservations and we will have 5 cars representing us. Three are members of CCMC and two are members of The Vette Set club in Gainesville. We expect to have a great time. Registration for the 2019 25th Anniversary event will open in September and to date we have four cars intending to go. A reminder, if you have any thought of going to this event the hotel rooms are going fast. I also want to thank our members at the July meeting for purchasing 25 Corvette raffle tickets for the September drawing! It was a great show of support for the Museum. I also talked to a member who changed his Corvette auto insurance to the NCM agency and he saved a substantial amount of money over his old insurance! It might be worth checking out. And, the club gets credit for each quote and each policy sold. So please let me know if you do either. As usual, let me know as you renew your NCM membership and or take advantage of any of the programs and offerings. We have four cars going on the ONE LAP OF KENTUCKY, October 22-27. I am waiting for the registration announcement, which I expect within the next few weeks. If you are thinking about going and have not contacted me, do it now. Once the registration opens, it will sell out very quickly. On the 2019 CARAVAN front, we have four cars currently making reservations and registration. WE are 'shadowing' the full Florida caravan so that we can utilize their event and hotel arrangements along the way and in Bowling Green. It may seem like a long way off but, hotels are filling up now. If you have any intention of going along without group, contact me asap for instructions on how to register and reserve lodging. At the March meeting I reviewed the plan for a fall road trip to the NCM and our participation in the ONE LAP OF KENTUCKY, Museum in Motion event. 2018 is the 9th annual tour that is run in partnership with the Kentucky State Police. This year's trip is a four night tour of northern Kentucky including Lexington (horse country) and Louisville. I'm told the tour will use the Butler State Park Resort as it's home site. Fees and schedules have not yet been published. Four dates are scheduled. Numbers of cars is very limited. This road tour is led by a Ky State Trooper in a marked red Corvette! Due to the overwhelming interest, we must be ready to register as soon as registration is open. Karen Renfrow, NCM events coordinator, has graciously offered to give me an advance notice of the opening. Interest to date is in the October 9-13 trip. Updated details will continue to be posted on the NCM Events web pages. If you are at all interested, please notify me (nickpe6@yahoo.com) or 352-877-3245 BEFORE April 1. I expect registration will open sometime immediately thereafter. Once it's open we'll have to act fast. As you new NCM Ambassador, i'm going to everything possible to increase and maintain our experience with the National Corvette Museum. During my membership, I have found that the more involved Rosalee and I become, the more we get out of the experience. Be it volunteer hours, Museum in Motion, the Bash, The Anniversary Celebration or just plain visits, the friends we have made through the museum have enriched our Corvette lives. So, what's on tap for this year. As I announced at he February meeting, I have at least two road trips planned to the Bowling Green area the fall. We will be making our annual trip to the Clarksville (TN) show and NCM visit at the end of September and we will be participating in one of the One Lap of Kentucky MiM trips in October. If you wish to to join these trips please convey your interest to me as soon as possible so that I can begin planning. I am also asking all NCM Annual Members to notify me when they renew their membership. That's all for now. I'll continue this with more news in the next few weeks. For all members of the CCMC I would like to announce your new Ambassador beginning in 2018 - Nick D"altilio. You all know him from being our President for 2016 & 17 and now he continues to serve our club as our representative to the NCN. He has great enthusiasm for the museum as it is our one and only place the contains the history of the corvette. Please welcome him and support him. I want to thank all those who supported me as Ambassador for the past 5 years. As I move up from VP to President I still have my full enthusiasm of the NCM and it's mission to promote corvette history and activities. Lee Holtman President CCMC. The annual Bash event is this April 27th thru 29th. Our President Nick will be attending this year and will be able to give us all the scoop at the May meeting. They reveal the 2018's at the Bash and everyone get a hands on look at the next year model. We will look forward to hearing what's new at the NCM museum. Also, for anyone planning a visit to Bowling Green and the plant, with change over occurring for the 18 models there will be tour dates limits. No plant tours will be conducted for May 8-12, 29th and then June 16th - TBD. So please check before you go. For the month of Feb. the NCM is again offering the family membership for half price of $50 that includes 2 memberships for a family for a year. Once you have this you can continue it each year. Joining the museum is a great way to support and belong to the only car museum for Corvettes. The existence of the museum is to preserve the heritage of the corvette and continue the growth of love for the sports car. Take the time to look over the NCM web site and see the value of belonging. When you sign up use the code VALDAY17 in the discount block. Let your Ambassador know if you joined and I will add you to our list of members on this page. The museum have several interesting exhibits going on this year ! One that may be of interest to Corvette lovers is the Callaway Corvettes exhibit that is on display from January 2017 until May 2017 is featuring the 40 years of history of Callaway performance cars that are famous for their superchargers and twin turbo's. I believe a couple of our members have owned Callaway cars and will tell you they are a lifetime experience in Corvettes. Their C-7 version that is describes in magazines is a monster of a car. Check out the info on the NCM web site. This coming year I am looking into challenging the museum recognition programs for clubs. They have dwindled down to the banner display, the newsletter, and the web site programs and I have realized that we as Ambassadors have no visibility into the criteria used to judge and just who is doing the judging. The Good Samaritan award was dropped which recognized a clubs good deeds towards their community or charity. That is one most clubs do as a not-for-profit organization and they only awarded one plaque with no other recognition for other club submittals, such as certificates of recognition to include the many other club submittals. This year I submitted our much improved web site after modeling it after the many other club sites I reviewed. Again, with not knowing any criteria or who's judging and was highly disappointed with the selected top 3 winners sites. I'm not being a poor loser on this but I see a need for some conversations with the NCM to try and help improve the process and get much needed information out to all the clubs and Ambassadors. I have contacted the NCM Board of Directors for some assistance and help in starting this process and will peruse it until I get some results. I felt the BOD is the place to start as they are members not paid staff. I'll keep you posted. One of our members was recently honored at the 22nd Anniversary event at the museum with a special dinner function and recognition ceremony. Howard Maxwell was honored for being one of only six other people who have been a member to the museum before the actual facility was built. He noted that when he started supporting them it was not much more than a small building that resembled a large storage shed. He has maintained personal contact with most of the directors as the NCM grew into what it is today. He received a 25 year member recognition certificate acknowledging his long term loyalty. Howie has been more than generous to the museum with the one acre program and multiple donations throughout the years. We are proud to have him in our club as a true Corvette enthusiast. Each year by the end of July your Ambassador reports all the NCM Club Member activities to show we are an active club under the NCM. The points reporting items are listed here under this page that members accomplish or participate in, are tracked by me as Ambassador. We have had a good year with items such a NCM membership, museum delivery program, several members visiting the museum, generous donations to the museum, and supporting raffles. Thank you to all those who support the museum in various ways. 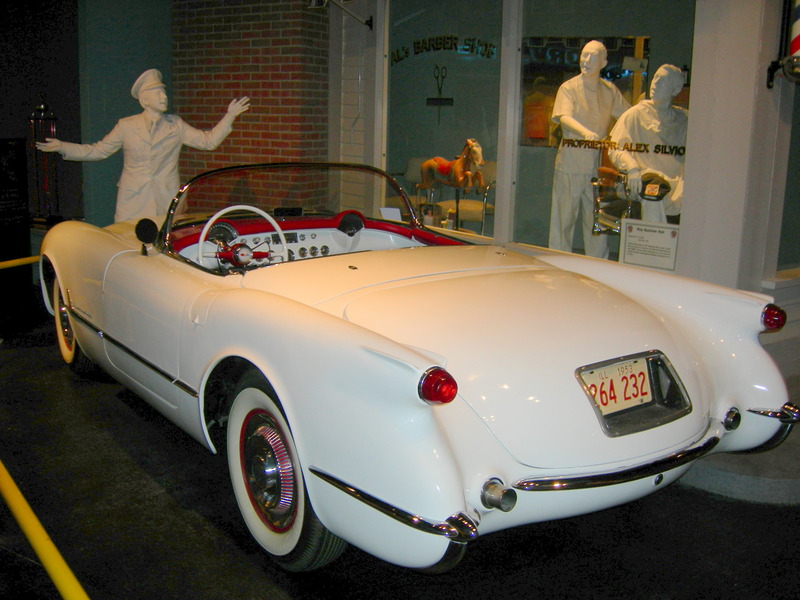 We are the only true American sports car with a historical museum to preserve it's history. I want to encourage more of our members to consider joining the Museum since it is a very nominal expense per year and it conveys a good sense of belonging. Any questions please see me - your Ambassador for more information. Each year the NCM reviews submitted club web sites and chooses their top 3 picks for recognition as exemplifying Corvette passion and club pride. This occurs in Sept. at the anniversary event at the museum. We will keep our enthusiasm up that we have met the mark that our site will be an example for other clubs to check out for ideas ! Earlier this month Wendell Strode was vacationing up in Alaska and developed some heart issues. Through my Ambassador FaceBook connection I have been watching for his status. Latest reports are good and he received great care in Alaska, a couple of stents, and has headed home to Bowling Green, KY. His family is caring for him and we all hope he will be back at the helm soon. Having all the great people at the museum continues to grow our focal point for our corvette nation. Hopefully members make use of the information and offerings the NCM provides us - even from a distance. The NCM supports Corvette Racing a lot in June each year. LeMans will be run on June 18th and 19th and the museum hosts a viewing party with lots of activities and actual real time satellite hookup for special viewing. The race team actually uses the Motorsports track for practice for LeMans since a portion of the track is replicating LeMans turns. Also starting June 8th there is a special exhibit for Indy 500 history there and you can go on their web site to learn more. Remember our club has some free admission passes to the museum for any non-members if your goin near Bowling Green KY. See your Ambassador for these passes. We proposed a tentative date and trip itinerary at the April member meeting. We waited to see if there were enough people interested to make this a club trip. Unfortunately there were not enough takers so we will see about considering a working volunteer trip at another time. A trip like this is not just for NCM members but everyone in our club. I want to remind members that if your considering an individual trip to the museum, the our club has a good number of admission passes for being a club (corporate) member of the NCM. As of April 1st 2016 the NCM will have the ability to do the ticketing for plant tours. This is a new working relationship with the Corvette plant in an effort to provide easier access for visitors. All the plant tour information is also available on the NCM web site. In an effort to show more activities in and around the NCM, there will soon be the 2 web cams up and running over at the Motorsports track. Previously they were shot from across the Interstate from the museum, but cable has been laid and the cameras will be operational to enjoy watching people run the track. February 2016 Your club officers would like to join many other Corvette Clubs in supporting the NCM with a “volunteer” visit to the museum. The NCM posts a constant calendar of club visits for the purpose of giving “time” to help out at the museum. This can be planned as a road trip event with some fun stops included. Since we are a distance from the museum we would plan the trip in segments. We can plan Ocala to Chattanooga TN 7.25 hr drive for first day and Chattanooga to Bowling Green KY 3.15 hr drive for arrival in the AM. The museum volunteer time would be approx. 4 hours of a day and time planned for a plant tour, or Motor sports track opportunity, or guided road tour. June is a pretty open month and good weather time. Going mid week into weekend days are best since plant tours are weekdays only. Track weekends are booked so a Touring lap would be best on a week day. To make this event happen we need members to commit and to provide input to the trip ! The NCM can provide your club with a guided tour of the NCM and the special behind-the-scenes tour. Kentucky has many beautiful Corvette roads just waiting for clubs to enjoy. We enjoy leading fellow Corvette Enthusiasts on these tours. Maps are also available from the Tourism Desk for clubs that would like to venture out on their own. Your club can commemorate your visit by having event badges created just for your visit. Some clubs like to contribute to the NCM with their time and talent. We always welcome this assistance. The purpose of the Ambassador Program is to provide Corvette clubs a two way communication link to the NCM. This program provides several opportunities to offer support through participation and involvement in the functions of the Museum. Corvette clubs can play an important role in the mission of the National Corvette Museum by providing the NCM and its staff guidance and assistance. Each participating Corvette club/organization selects an "Ambassador" to act as the liaison of that club/organization to the National Corvette Museum. The Ambassador's mission is to receive and disseminate the most current and correct information from the Museum, and to convey that information to the club. The Ambassador will act as a Museum representative to promote and solicit support for the Museum through promotional activities and encourage other Corvette enthusiasts to join the Museum. Additionally, the Ambassador will be the voice of our club, communicating concerns, ideas and suggestions to the NCM. Attending NCM Function/Event: You can claim points for any club members that attend. Volunteering for NCM: You can also claim points for club members who volunteer. NCM Insurance Quote/Policies: Points can be accrued for any club members who participate. NCM Delivery/Xperience: Club members who take part during timeframe above. One Acre Club: Actively paying commitments of your club towards the Motorsports Park annually earn these points. Other Donations to NCM: Motorsports Park (other than One Acre Club), general donations, or any additional programs throughout the timeframe not included above and made during timeframe.